Christian Democratic Union CDU party leader and German Chancellor Angela Merkel reacts on first exit polls in the German general election (Bundestagswahl) in Berlin, Germany, September 24, 2017. BERLIN - Germany’s Angela Merkel turns to the complex task of sounding out partners in a potentially fragile coalition after securing a fourth term as chancellor in Sunday’s election even though her conservatives bled support to the far-right. 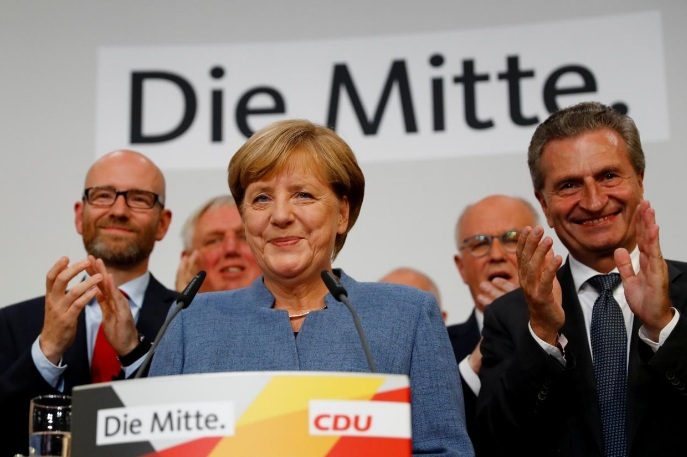 Damaged by her handling of the 2015 migrant crisis, Merkel’s conservative bloc won 32.9 percent of the vote, down 8.6 points from the 2013 election and hitting its lowest level since 1949. However, hers was still the biggest parliamentary bloc and Europe’s most powerful leader stressed that as the strongest party, her conservatives have the mandate to form the next government. “There cannot be a coalition government built against us,” she said, adding she was sure there would be a stable government by Christmas. However, a complicated and potentially unstable three-way coalition with the pro-business Free Democrats (FDP) and Greens, untested at the national level, with a weaker Merkel could unsettle investors. The euro slipped in early Asian trading on Monday trading down 0.4 percent at $1.1906, with the prospect of months of uncertainty in Europe's biggest economy looming. One of the biggest shocks was the strength of the Alternative for Germany (AfD) which won 13.0 percent of the vote. It was the first time a far-right party entered the German parliament in more than half a century. One of the AfD’s leading candidates, Alexander Gauland, gave a foretaste of what is to come, vowing to “hound” Merkel and “get our country and our people back”. Industry leaders urged Merkel to move fast. “Our companies need clear signals. Now it’s all about averting damage to Germany as a place of business,” Dieter Kempf, president of the BDI industry association, said. After her current Social Democrat (SPD) coalition partner, said it would go into opposition after slumping to a post-war low of 20.6 percent, Merkel’s main option is to pursue a three-way partnership. A “Jamaica” alliance of her conservative bloc, the FDP, on 10.6 percent, and the Greens, on 8.9 percent, could be fragile due to fundamental differences on issues from migrants to tax and Europe. In particular, a weakened Merkel who has to share power with the FDP is likely to create problems for deeper integration of the euro zone as suggested by French President Emmanuel Macron. Final results are due early on Monday and during the day, parties will meet and hold news conferences. Germany’s Angela Merkel turns to the complex task of sounding out partners in a potentially fragile coalition after securing a fourth term as chancellor in Sunday’s election even though her conservatives bled support to the far-right.